“We went to school that Tuesday like normal. Not all of us came home . . .” Huddled in a cloakroom with his classmates and teacher, six-year-old Zach can hear shots ringing through the corridors of his school. A gunman has entered the building and, in a matter of minutes, will have taken nineteen lives. In the aftermath of the shooting, the close knit community and its families are devastated. Everyone deals with the tragedy differently. Zach’s father absents himself; his mother pursues a quest for justice — while Zach retreats into his super-secret hideout and loses himself in a world of books and drawing. Ultimately though, it is Zach who will show the adults in his life the way forward — as, sometimes, only a child can. This must be one of the most powerful books I’ve read for ages. In fact I don’t remember reading anything quite like it. It’s emotional, moving and absolutely compelling – I loved it. One of the things I loved most about it is the narrative voice – that of seven-year old Zach. Everything is shown through his perspective, as he sees and hears what happens – so, for example the shooting, the sounds ‘pop’, ‘pop’, ‘pop’ are described as Zach hears the gunshots. There are no gory or violent scenes. But that is just the start of the book. The main part shows how he deals with what happens next, with the death of his ten-year old brother, Andy, and how he tries to make sense of his parents’ reactions and his own. I think Rhiannon Navin portrays him well. He comes across as a child who observes the adults around him and tries to understand his own feelings. The scenes in his secret hideout are beautiful as he records his feelings as colours to help him separate them and deal with them. He also reads the Magic Treehouse books about finding the secrets of happiness. Zach’s mother falls to pieces, wanting the gunman’s parents to take responsibility and looking for justice/revenge, his father becomes increasingly distant and although both Zach’s grandmothers and aunty are around for support he retreats into himself and then becomes angry, which bewilders and frightens him. He tries to explain to his parents how he is feeling and although his father listens and tries to helps him, his mother is totally absorbed in her own feelings. When his father decides to leave the family Zach is devastated. It is a heart-wrenching book, that brought tears to my eyes. 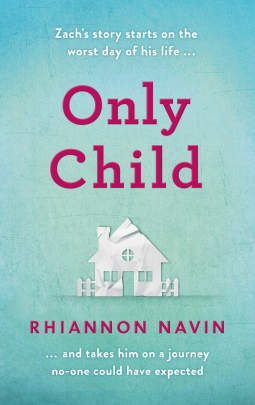 All of which makes me admire Rhiannon Navin’s portrayal of the characters in this, her debut novel. It is such a sad book, but ultimately it is uplifting. It sounds very powerful, Margaret. And it’s not easy to do a child’s voice well; I give Navin credit for pulling it off well. I’ve read a couple of other reviews of this book and both were very, very positive. I’ve heard that it’s sad, but well worth it. I’ll be planning to read this one at some point. It does sound very powerful. I’m not sure I’ll be reading it but I applaud the author. An impressive debut.